Elasticsearch has the speed, scale, and flexibility your data needs — and it speaks SQL. Use traditional database syntax to unlock non-traditional performance, like full text search across petabytes of data with real-time results. Elasticsearch is a full text search engine with all the goodies you’d expect, like relevance scoring, stemming, synonyms, and more. And since it’s a distributed document store — with horizontal scalability — it can handle billions of rows of data without skipping a beat. With Elasticsearch SQL, you can access that full text search, blazing speed, and effortless scalability with a familiar query syntax. Use your SQL skills to query data within Elasticsearch, harnessing the power of Elastic with a familiar language. Send your SQL queries via a CLI, REST endpoint, or JDBC to get your results with newfound speed. You’ll even see your results in the same tabular views you’ve been getting since your first SELECT statement. Use Elasticsearch SQL query syntax to build live, infographic-style presentations in Canvas. 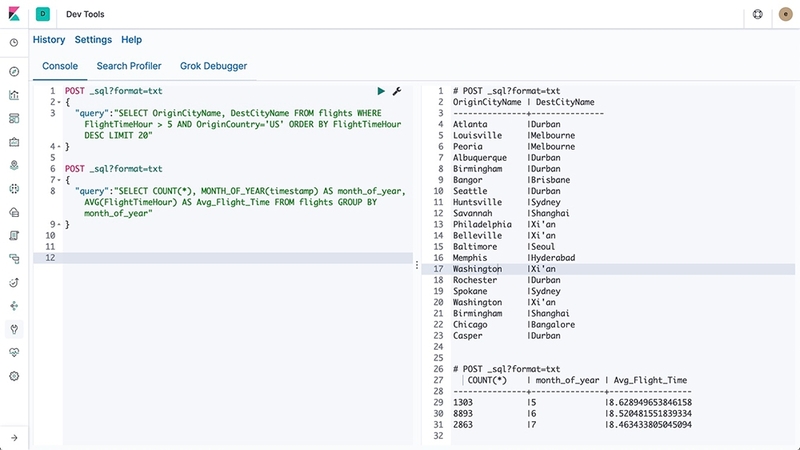 Query, aggregate, and shape your Elasticsearch data with SQL syntax — painting your data points into a story that goes beyond the grid. Learning a new language requires either a good teacher or a good dictionary. With our Elasticsearch SQL translate functionality, you get both. Every time you run a SQL command, you can see the exact Query DSL statement being run against your data in Elasticsearch. Once you’re comfortable, take your queries a step further by trying out our expansive Query DSL. Find out for yourself how easy it is to query Elasticsearch data with SQL.